The Sacred Hearts Academy iPads For Success, Claymation 1, Claymation 2, and Lights! Camera! Action! summer school classes are looking forward to their Red Carpet Event on Thursday, July 9th, 2015! Have some spare time? Stop on by the Lower School Library and catch a student made movie - complete with ice cream sundaes for the families of the movie-making students! 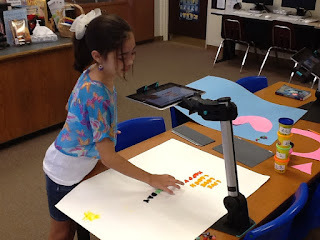 iPads For Success: 8:00 a.m. to 8:50 a.m.
Claymation 1: 8:55 a.m. to 9:45 a.m.
Claymation 2: 10:00 to 10:50 a.m. Lights! Camera! Action! : 10:55 a.m. to 11:45 a.m.